Painted this last Saturday after shopping at the Farmer’s Market – love these sweet little round eggplant!! This entry was posted in eggplant and tagged alla prima, Bridget Hobson, eggplant, Hobson Fine Art, Kitchen Art, kitchen still life, Malibu Artist, oil on gessoboard, oil painting, original oil painting, wordpress artist on July 29, 2016 by Bridget Hobson, artist. Yesterday’s early afternoon painting – a study of perfume bottles. CLICK HERE for purchase and price information. This entry was posted in Perfume, still life and tagged alla prima, boudoir, Bridget Hobson, Hobson Fine Art, just for girls, ladies room, Malibu Artist, original oil painting, perfume bottles, vintage perfume bottles, wordpress artist on May 23, 2016 by Bridget Hobson, artist. A commissioned painting created for my cousin’s daughter. Inspiration – a photo of her child and her nephews, lifting the bird net in search of the best berries from their Grandfather’s berry bushes. This entry was posted in People, Uncategorized and tagged alla prima, Bridget Hobson, Hobson Fine Art, Malibu Artist, original oil painting, wordpress artist on January 12, 2016 by Bridget Hobson, artist. One cracked and one intact – a luscious addition to anyone’s kitchen. CLICK HERE for purchase and pricing info. This entry was posted in Egg, still life and tagged alla prima, Bridget Hobson, egg painting, egg white, egg yolk, Hobson Fine Art, Kitchen Art, kitchen still life, Malibu Artist, oil on gessoboard, original oil painting, restaurant art on November 18, 2015 by Bridget Hobson, artist. Inspired from a screen shot – this portrait of Juliette is even more vibrant in real life. Painted Alla Prima, of course – which means I finished it in one setting while the paint was wet and fresh and lively. CLICK HERE for purchase and pricing info. 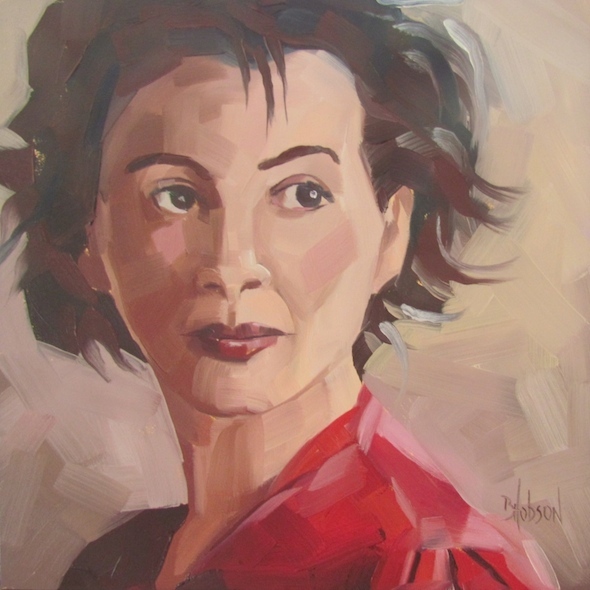 This entry was posted in Portrait and tagged alla prima, Bridget Hobson, female portrait, Hobson Fine Art, Juliette, Juliette Binoche, Juliette portrait, Malibu Artist, original oil painting, portrait woman, woman's face on April 18, 2014 by Bridget Hobson, artist. Angela lives in Prague, Czech Republic. This painting is inspired from a self-portrait photograph of her. SO MUCH FUN to paint it! 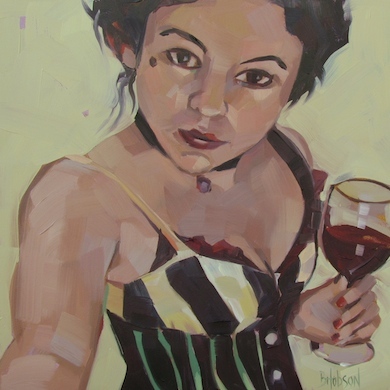 This entry was posted in Portrait and tagged alla prima, Bridget Hobson, female portrait, Hobson Fine Art, Kitchen Art, original oil painting, portrait, wine glass, wordpress artist on March 24, 2014 by Bridget Hobson, artist. On a roll with onion paintings! 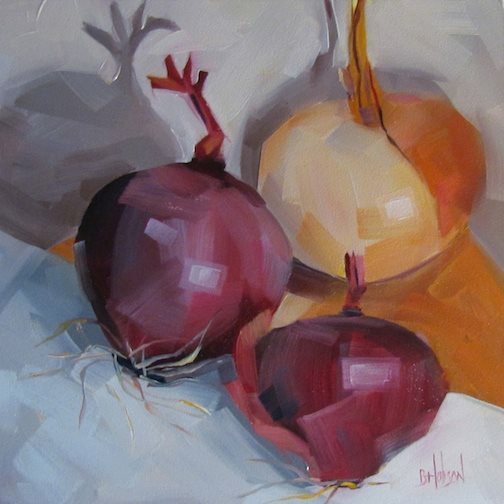 This entry was posted in Onion, still life and tagged alla prima, Bridget Hobson, Hobson Fine Art, Kitchen Art, kitchen still life, Malibu Artist, original oil painting, purple onion, red onion, shadows, wordpress artist on March 24, 2014 by Bridget Hobson, artist.